These are fitting for today, don’t cha think? It’s Super Bowl Sunday, it is freezing and or snowy in most places and all Sundays should include comfort food. 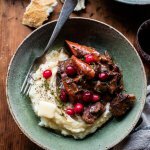 Including foods that are pantry staples… just in case you are snowed in……like me. No exaggeration. At this point, the snow is up to my thighs and my front steps no longer look like steps. They just look like a white hill. And yes, I totally tripped walking up them yesterday, but it was ok since there was so much snow there to break my fall that it felt like landing on a pillow. A very cold pillow. “They” are calling this storm a once in every 20 years storm. I have to say, I have not seen this much snow in the seven years we have lived here. So these potatoes, I actually made them over Christmas. My cousins where in town and I was feeding a crowd and everyone in that crowd liked potatoes, bacon and cheese, so these where obviously a hit. Ok, so I have to tell you guys about this photo my cousin Abby posted. Abby is in Vermont and I do not know what’s going on over there, but yesterday she must of been looking through old photos and she found a gem. A real throwback Gerard Family Gem. If you are interested in what my hillbilly family looked like as kids/babies check out this photo. PS. I am the bald girl with the hat. I never had any hair as a baby and now my hair goes down to my lower back. <–Yeah, I need a hair cut, but who has time for that? PSS. Yes, we are freaky looking clan! Last thing. Go Broncos! My Cleveland family is going to hate me, but when you have a team in the Super Bowl you gotta root for them!! Get the recipe for the potatoes here. Seriously, do it. There is even buffalo sauce involved! 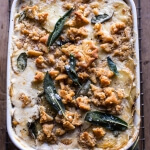 Cheesy Potato Au Gratin with Buttery Ritz Cracker Crumbs. 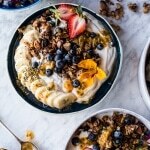 Blueberry Muffin Granola Greek Yogurt Breakfast Bowl. Oh my, as soon as I saw that cheese go in I was sold! I think this is going to replace my boring old baked potatoes. Aw, I’m sorry you’re snowed in. But hey, at least you have cheese. We got a light dusting this week (three inches at most) and everybody freaked out. It doesn’t snow often here, so and the roads were a mess. All the northern transplants didn’t know whether laugh or facepalm. And yes, cheese is good! It said page could not be found for the picture of your family. The potatoes look very tasty. Oh man! Really? I will check the link! The potatoes look amazingly oozy and gooey and tasty! Never made hasselback potatoes before but look great for a party!! Thanks Kathy! Hope you love them! I have always wanted to make these! If my Husband had a Pinterest board, these would be on it! I love how you actually stuck blocks of cheese between the potato slices. Swooning! Hopefully your cable hasn’t been affected by the snow! Stay warm. Cheesy potatoes look so good with the oozy-gooey melted of the cheese! These look amazing Tieghan! The melted cheddar cheese and bacon are heavenly 🙂 Pinned. I can get behind these. With a fork. I can’t believe you have snow up to your thighs! That is crazy! Good thing you have these to comfort you – they look so delicious! Perfect comfort food. Going to check out the recipe now! Thanks so much for checking the recipe out, Cate!! I can’t imagine being snowed in but at least you have these incredible potatoes to dig into – love all the toppers! 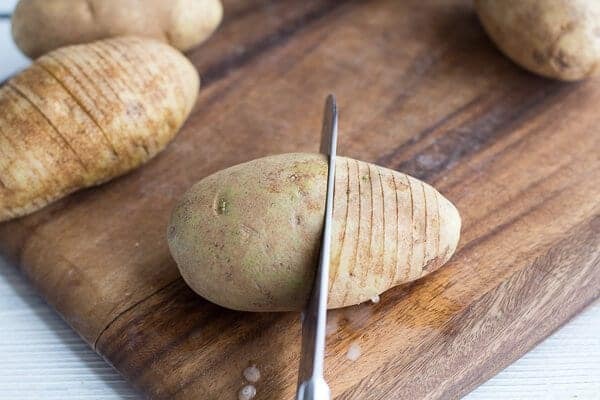 I want to make hasselback potatoes but every time I try I always end up cutting all the way through the potato at some points. Ugh! These look dreamy. Yeah, I had to be super careful about cutting through the potato. It was worth it though!! Goodness gracious those look absolutely amazing. 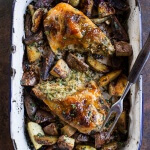 Great recipe, definitely bookmarking this for later! I love that you stuffed these with cheese. So much cheesy goodness. Love! Now that is some serious potato yum. Love!! Well, after yesterday the first thing I want to say is. I’m sorry about your Broncos…. It was a tough game to watch. 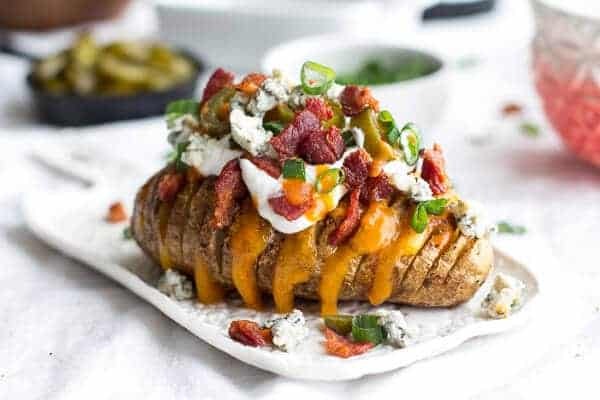 These look awesome Teighan, I so need to make me some hasselback potatoes. The bacon in these photos looks so crunchy and delicious, no wonder everyone loved these at christmas! Pinned! Ha! Yeah, It was bad. These are GORGEOUS! 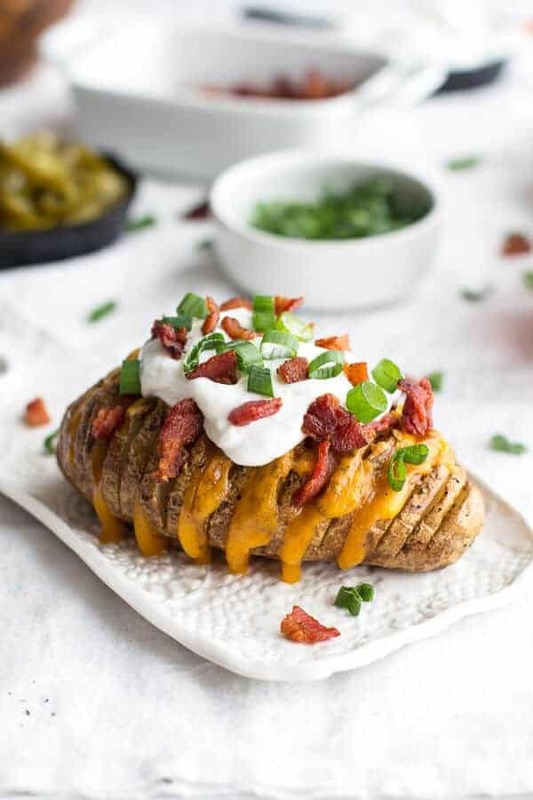 I’ve still never made hasselback potatoes; the cheese and bacon just pushed me over the edge! The cheese and bacon with potatoes is the best combo! 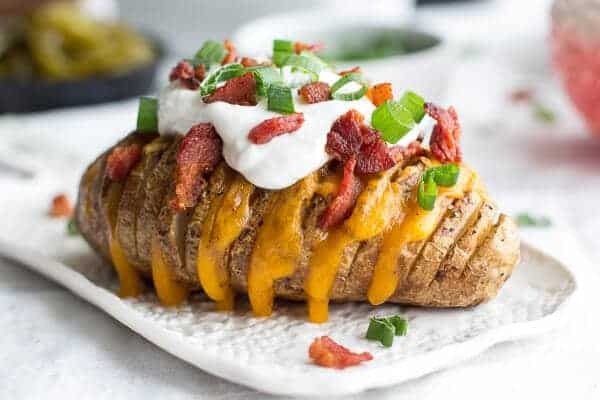 Yes to these baked potatoes. Yes, yes, yes!! 🙂 No,no no to the snow though!! 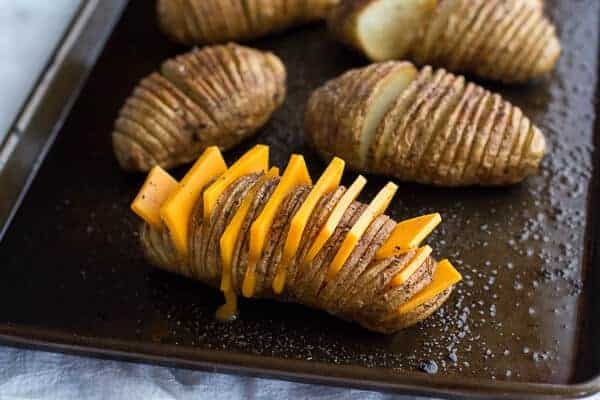 Call me crazy but I’ve actually never had hasselback potatoes before and OH MY GOD I am DYING to try some now! I am seriously salivating and craaaaving all of that salty, cheesy, bacon-y goodness. I’m rooting for this team in the Super Potato Game. Thanks Hayley! ANd make a hassselback already! I want to bury my face in this! Loaded potatoes are a huge weakness of mine. Looks delish! Oh my god. I’m so terrible at hasselback potatoes. I’ve made them at least 4 times, once with a convection oven, three times in a regular oven, and the potato always comes out half baked and sort crunch =S But they always look so delicious. Gorgeous photos as always Tieghan! Thanks so much, Lisa! You should give them another try! When I make these or twice baked potatoes, I brush the potatoes with bacon grease before baking. YUM! 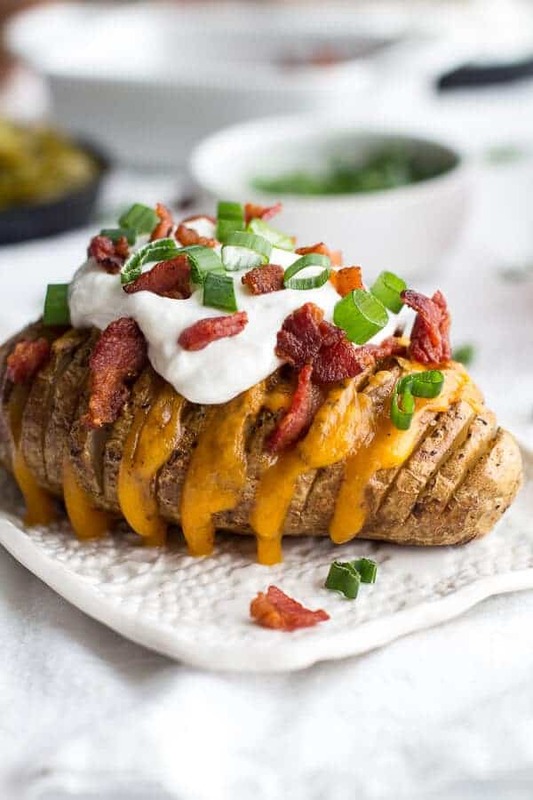 I cannot find the recipe for ‘Loaded Hasselback Potatoes’ that this page alludes to. Where can I find it? Loved the cheese on there! That’s how you make food beautiful!